Cannas (members of the Cannaceae family) are not actually lilies, but for some reason unknown to me, that's what people call them. I just call them beautiful. 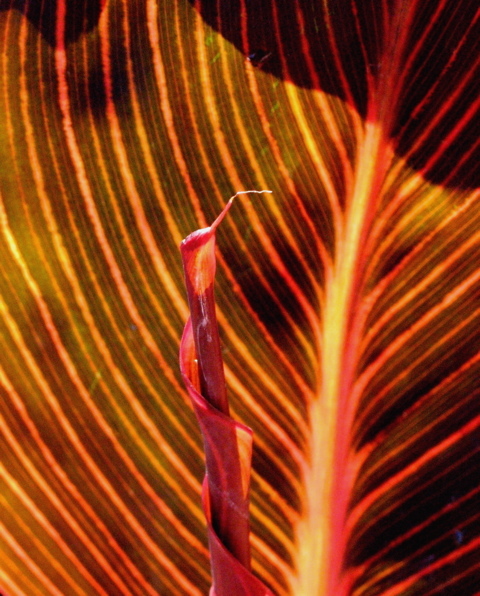 Their big, colorful leaves remind me of banana trees and their exotic flowers make me think of the tropics. Even if Cannas never flowered, their variegated foliage would make them worth growing. Look for the green-yellow variegation of 'Pretoria', as you see above, or the red-yellow-pink-green leaves of 'Tropicana' at top. Others like 'Red King Humbert' and 'Wyoming' have mahogany leaves. Dwarf varieties get 18" to 3 feet tall. Standard varieties reach 4 - 6 feet tall. Canna flowers may be yellow, orange or red. 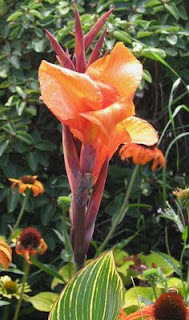 In Seattle, cannas are most often grown as annuals. They will over-winter in mild years, but the past few have been too cold for many to survive. 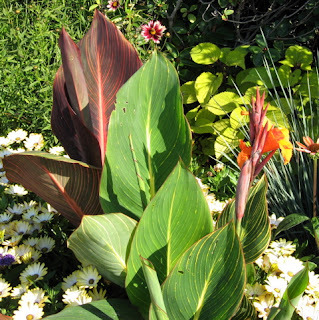 Cannas do well in containers and as focal points in mixed borders. When they are blooming, they're a sure sign of summer in Seattle.